Last month, Snow was given the opportunity to try out the Army's new Squad Designated Marksman Rifle, or SDM-R. After just a couple days handling the new weapon, he said it felt like something that could fill the needs of both his previous weapons. It had more mobility and close combat capabilities like the M-4, but also better precision at a distance like the M-110. "Its easy to move around, and you can do a lot of things with it," Snow said. "Absolutely, I would carry this around every day if I was deployed. Every day, you could carry it for every single situation." That was exactly the type of weapon that the Army looked to create for its combat arms squads  a weapon for one member of an infantry, armor, cavalry scout or combat engineer squad to carry and provide precision fire between 300 and 600 meters without losing the capability of hitting closer-range targets. The need for such a rifle was identified in the 2015 Small Arms Capabilities-Based Assessment that stated squads must have an organic, precision-fire capability to engage select personnel targets from zero to 600 meters." Read the rest of this SDM-R rifle. .308... an assault/battle rifle. Pretty cool. To: Who is John Galt? "Every day, you could carry it for every single situation." It's not. It's a 5.56x 45. The article shows it as 7.62? Cuomo would limit it to 7 rounds. I’m dubious of one-size-fits-all solutions. Got to be compromises which tend to limit capabilities at the margins. At least it’s 7.62 x 51. Looks like a great rifle - like the suppressor: it helps keep the firer better hidden, reduced the dust and flash from the shot and allows the shooter to hear commands better. Would still prefer the M-14, though..
An oddity in the article: it listed the weights for the M16, M4, and the M110 but didn't describe the weight of the new rifle...? Did the military really move away from .45 because female service members had more difficulty with it, or is that internet hogwash and it was just a NATO thing? If true I could see similar concerns raised about a .308, now that the infantry is open to females. The usability of everything, body armor, harnesses, weapons, have to be considered through the additional lense of a subset of soldiers with smaller stature and less body strength. The DoD did make a big show last year about releasing a new X-back helmet to accolade ponytails. I got that from Wikpedia. I scanned the article and couldn’t fine the caliber. I am guessing the article is correct and Wikipedia is outdated. They’ll be great for the new People’s Army to use against the few remaining conservatives in the country. First thing I looked for. 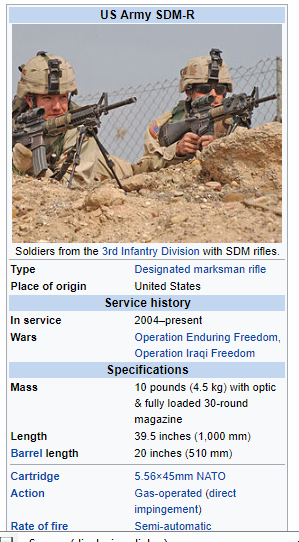 Evidently the SDM-R designation was given to a previous iteration of the rifle. The new version is 7.62. Not too much different from the Ruger SR-762 except for the piston. The original DMR was actually an old school, M16A2, that was “accurized”. Heavier barrel, fixed stock, optic and those guys carried different rounds, than the standard issued 556. I want to say they were shooting 75 or 77 grain. This new rifle is a 308. More or less a 308, with a shorter barrel than a sniper rifle. "Did the military really move away from .45 because female service members had more difficulty with it, or is that internet hogwash and it was just a NATO thing?" The story has always been that it was a NATO compliance thing, and I tend to agree. The M9 was adopted back in the 80s when women were still a much lower % of the active force, and if the M9 was more compatible for females due to lower recoil, it was more problematic for them due to the larger/fatter grip. Furthermore, the M1911A1s in the inventory at that time were pretty ragged and worn. What have heard, and do believe is that the FBI's short-lived affair with the 10mm was in fact based largely on the inability of the growing number of female agents to tolerate the recoil of full power loads. The link given shows a 7.62x51 (.308). They moved away from the .45, more or less, because of NATO and Congressmen getting Beretta to open a plant in Maryland, thus creating jobs for constituents. The M9 is/was a vastly harder gun to shoot than a .45 ACP. You had to have rather large hands to really be able to shoot it and the initial, double action, trigger pull was a monster. But, it is still probably one of the more accurate pistols out there.